Rotek Series 12,000 slewing bearings offer a unique combination of rolling elements. Series 12,000 incorporates a row of rollers and a row of balls into the same unit. This combination of rolling elements is designed to handle small eccentricities at relatively high axial loads. 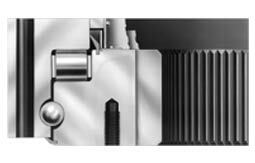 Raceway Diameters: Standard models are 50" to 180"
Moment: Up to 51,600,000 ft-lbs.